Anything with cranberries, of course! Okay, cranberries aside, I’d have to go with lobster. I had it once on a long weekend trip to Maine and it was love at first bite. Sadly, it’s too expensive to buy here in the Midwest. I was afraid you’d ask me that! How can I pick just one? Greg (he owns Book ‘Em in town) and I love discussing books and read a wide range of authors. Certainly Agatha Christie would be up at the top. I love the way she weaves her clues into the story and I love the characters. It’s also fun to take a trip back in time. There isn’t much time for hobbies when you work on a cranberry farm. Of course I love to bake, but that’s part of my job. And I love reading and make sure I have at least half an hour each night to curl up with a good book. I am in a book club that Greg runs at Book ‘Em, which I really look forward to. And someday I’d love to learn to knit even if I am all thumbs! People who are late. I can’t help it—my parents trained me to always be on time and there’s nothing worse than standing on a street corner or sitting at a table in a restaurant waiting for someone to show up. The people! I love the people here. They’ve been so welcoming to me. And they’re far more diverse than you’d expect in a small town. I plan on staying here at Sassamanash Farm. I’d like to do some traveling, but this place has gotten under my skin and has become home. Also, I think there are some big plans for me in Cranberry Cove book number four, but the author refuses to tell me what they are. 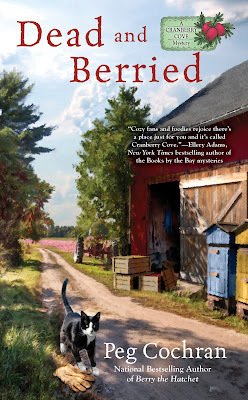 To celebrate the release of Dead and Berried, I'm giving away one copy to a reader who leaves a comment! Tell us what one of your favorites is! Great cover. Like Monica I need to read at least a half hour at night and I love cranberries. We have a lot of bogs in the Plymouth/Carver area. Thanks for the opportunity to continue with this series. I love fresh cranberry sauce. Also cranberry pie which is really more of a cake. Cranberry orange bread ----I never met a loaf I did not like. I am a reader who takes whatever time I can find to read. I always have a book or my kindle with me. And I love the cover of Dead and Berried. One of my favorite things are fresh green beans from the garden! I just got all the seeds planted about ten days ago and guess what was starting to sprout up this morning!!?? Thanks so much for the chance to win! One of my favorite summer drinks is lemonade. Thank you so much for the chance to win! My favorite is my husband of 45 years! He still makes me laugh! I do love to knit, so I hope you master this at some point. It is very relaxing. One of my favorites is my family! I am so blessed! 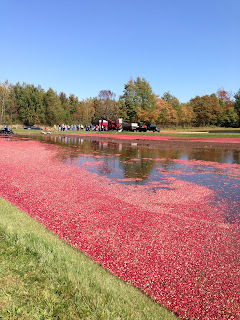 I am really enjoying this series and would love to visit a real live cranberry farm one day. No need to enter me to win as I've already got a copy sitting on my coffee table waiting to be cracked open just as soon as I finish my current read. My favorite destinations are Montana and Maine. bobwiesmann-at-gmail-dot-com. One of my favorites is Agatha Christie also but I am reading and loving another Author of that Era, Margery Allingham. Thank you for the chance to read one of your books.